Just as MoMA was founded by three pioneering women in 1929, MoMA’s digital presence was established by two visionary women. 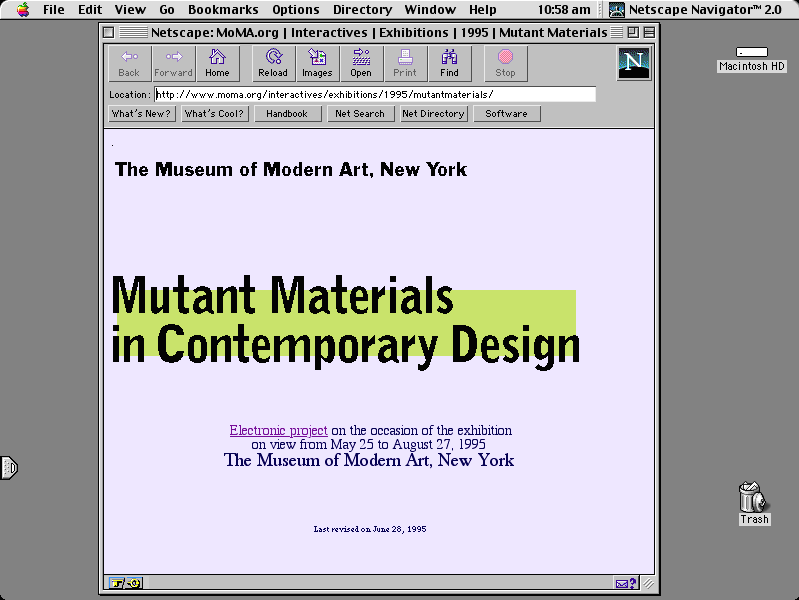 Already disruptive in their curatorial practice, Paola Antonelli and Barbara London handcrafted websites for their 1995 exhibitions Mutant Materials and Video Spaces. eBay, Amazon and Match.com also joined the web in 1995, a year marked by the cinematic release of Toy Story, the first completely computer-animated feature film. Larry Page and Sergey Brin met at Stanford in 1995 but Google.com wouldn’t be registered until 1997. Blogging was a nascent practice but it wouldn’t actually be called that until later. The big players were certainly emerging but the web felt more countercultural than it does now. My favorite website at the time was the Australian cyberfeminist zine, Geek girl by Rosie X. Tentatively described as “electronic pilot projects”, Mutant Materials in Contemporary Design (May 25th) and Video Spaces: Eight Installations (June 22nd) were developed in collaboration with Adrianne Wortzel and Joe Ferrari, then at the Institute for Computer in the Arts, School of Visual Arts (SVA). The sites were originally hosted on the SVA server, thanks to Timothy Binkley, Director of the Institute. 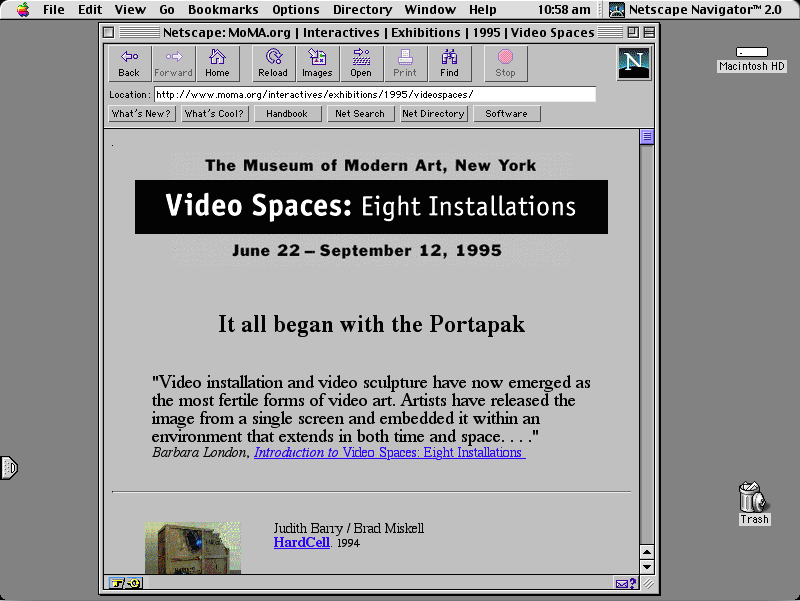 MoMA hosted its own website, on moma.org, the following year. You can see a partially complete snapshot of that 1996 website using the Wayback Machine. Over the past 20 years, MoMA has produced more than 200 project-specific websites, working with many of the world’s leading web designers. Taken together, these websites represent a fascinating 20-year capsule of web design history — and not just because 90s web design is hot again. MoMA is part of the New York Art Resources Consortium (NYARC), a collaboration with the Brooklyn Museum and Frick Collection to archive digital art historical resources, such as web-based auction catalogues, catalogues raisonnés, and artist, gallery, and museum websites. This project is archiving all of MoMA’s websites and testing and correcting those that use obsolescent technologies. While MoMA’s first websites, hand-coded in html, work now as they did then, others have required extensive quality assurance. In celebration of today’s anniversary, Seth Persons, NYARC Web Archiving Intern, has posted about this work on MoMA’s blog. MoMA’s new content strategy is mobile first and concentrated on the heavily-used pillars of the website, such as the collection and the calendar. We’re also creating an integrated index of all MoMA exhibitions, from 1929 to now (almost 2,000 shows), aggregating assets like exhibition checklists, press releases and installation views. Custom-designed exhibition websites are now the exception at MoMA but I wanted to pause on the occasion of this 20-year anniversary to celebrate the prolific curatorial and design creativity of all that came before. Thanks to @benfinoradin for the Netscape screenshots and @ninabeans for the animated sample of MoMA’s more than 200 websites (with music by David Moreno).